My research interests are primarily in survival and event history analysis with a particular focus on the analysis of multi-state survival data subject to incomplete or non-standard observation schemes. My work in this area has included development of methods to account for misclassified disease diagnoses, time non-homogeneity and non-Markov behaviour of the underlying process. Current work includes methods for accounting for informative observation times, general tests of the Markov assumption and applications to the design and analysis of oncology trials. Additionally, I have a strong interest in applied statistical problems across a wide range of disciplines. I have an interest in latent variable models such as item response and structural equation models, particularly in respect to modelling longitudinal or cross-sectional patient reported outcome data. Weber EM, Titman AC. Quantifying the association between progression-free survival and overall survival in oncology trials using Kendall's τ. Statistics in Medicine. 2019. 38: 703-719. Dobler D, Titman AC. Time-dynamic inference for non-Markov transition probabilities under independent right-censoring arXiv:1704.03304, 2019. Preprint. Morgan LE, Nelson BL, Titman AC, Worthington DJ. Detecting Bias due to Input Modelling in Computer Simulation Proceedings of the Winter Simulation Conference, 2017. 1975-1985. Brückner M, Titman A, Jaki T. Estimation in multi-arm two-stage trials with treatment selection and time-to-event endpoint. Statistics in Medicine, 2017. 36 (20): 3137-3153. Wan F, Titman AC, Jaki TF. Subgroup analysis of treatment effects for misclassified biomarkers with time-to-event data. arXiv:1708.00942, 2017. Preprint. Titman AC. Non-parametric Maximum likelihood Estimation of Interval-Censored Failure Time Data Subject to Misclassification. Statistics & Computing, 2017. 27: 1585-1593. McCray GPJ, Titman AC, Ghaneh P, Lancaster GA. Sample size re-estimation in paired comparative diagnostic accuracy studies with a binary response. BMC Medical Research Methodology, 2017. 17: 102. Morgan LE, Nelson BL, Titman AC, Worthington DJ. Input uncertainty quantification for simulation models with piecewise-constant non-stationary Poisson arrival processes Proceedings of the Winter Simulation Conference, 2016. 370-381. Titman AC. Estimation of Time Shift Models with Application to Survival Calibration in Health Technology Assessment. Statistics in Medicine, 2016. 35 (20):3645-3656. Titman AC, Lancaster GA, Colver AF. Item response theory and Structural Equation Modelling for ordinal data: describing the relationship between KIDSCREEN and Life-H. Statistical Methods in Medical Research, 2016. 25: 1892-1924. Titman AC. Transition Probability Estimates for Non-Markov Multi-State Models. Biometrics, 2015. 71 (4): 1034-1041. Titman AC, Costain DA, Ridall PG, Gregory K. Joint modelling of goals and bookings in association football. Journal of the Royal Statistical Society, Series A. 2015. 178: 659-683. Titman AC. A pool-adjacent-violators type algorithm for non-parametric estimation of current status data with dependent censoring. Lifetime Data Analysis, 2014. 20: 444-458. Titman AC. Estimating parametric semi-Markov models from panel data using phase-type approximations. Statistics & Computing, 2014. 24: 155-164. Titman AC, Lancaster GA, Carmichael K, Scutt D. Accounting for bias due to a non-ignorable tracing mechanism in a retrospective breast cancer cohort study. Statistics in Medicine. 2011. 30 (4): 324-334. Titman AC, Sharples LD. Model diagnostics for multi-state models. Statistical Methods in Medical Research. 2010. 19: 621-651. Titman AC, Sharples LD. Semi-Markov models with phase-type sojourn distributions. Biometrics. 2010. 66 (3): 742-752. Titman AC. Computation of the asymptotic null distribution of goodness-of-fit tests for multi-state models. Lifetime Data Analysis, 2009. 15 (4): 519-533. Titman AC, Sharples LD. A general goodness-of-fit test for Markov and hidden Markov models. Statistics in Medicine. 2008. 27: 2177-2195. Titman AC. Model diagnostics in multi-state models of biological systems. PhD Thesis, University of Cambridge. 2008. Nampijja M, Kizindo R, Apule B, Lule S, Muhangi L, Titman A, Elliott A, Alcock K, Lewis C. The Role of Home Environment is Important in Neurocognitive Development of Children living in extreme poverty and frequent illnesses. Wellcome Open Research. 2018. 3: 152. Lancaster G, McCray G, Kariger P, Dua T, Titman A, Chandna J, McCoy D, Abubakar A, Hamdani, J, Fink G, Tofail F, Gladstone M, Janus M. Creation of the WHO Indicators of Infant and Young Child Development (IYCD): meta-data synthesis across ten countries. BMJ Global Health. 2018. 3: e000747. Leong KS, Titman A, Brown M, Powell RF, Moore E, Bowen-Jones D. A retrospective study of seven-day consultant working: reductions in mortality and length of stay. Journal of the Royal College of Physicians of Edinburgh. 2015. 45: 261-267. Selinger CP, Andrews JM, Titman A, Norton I, Jones DB, McDonald C, Barr G, Selby W, Leong RW. Long-Term follow up reveals low incidence of colorectal cancer, but frequent need for resection, among Australian patients with inflammatory bowel disease. Clinical Gastroenterology and Hepatology. 2014. 12: 644-650. Deasy C, Titman A, Quinton JN. Measurement of flood peak effects as a result of soil and land management, with focus on experimental issues and scale. Journal of Environmental Management. 2014. 132: 304-312.
Cooper H, Spencer J, Lancaster G, Titman A, Johnson M, Lwin R, Wheeler S, Didi M. Development and psychometric testing of the on-line Adolescent Diabetes Needs Assessment Tool (ADNAT). Journal of Advanced Nursing, 2014. 70 (2) 454-468. Tan M, Kayani, S, Shaw, B, Dewhurst C, Titman AC, Lancaster GA, Alfirevic Z. Two-year outcomes for infants with low cord pH at birth. Journal of Maternal-Fetal & Neonatal Medicine, 2014. 27:1010-1014. McKean K, Key T, Peacock S, Parameshwar J, Taylor CJ, Titman A, Goodman RS. Influence of donor and recipient PECAM-1 and ICAM-1 genotype on the incidence and progression of post-transplant cardiac allograft vasculopathy. International Journal of Immunogenetics. 2010. 37: 415-415. Jaki, T., Gordon, A., Forster, P., Bijnens, L., Bornkamp, B., Brannath, W., Fontana, R., Gasparini, M., Hampson, L.V., Jacobs, T., Jones, B., Paoletti, X., Posch, M., Titman, A., Vonk, R., Koenig, F. A proposal for a new PhD level curriculum on quantitative methods for drug development. Pharmaceutical Statistics. 2018. 17:593-606. Lancaster GA, Titman AC. Using evidence from quantitative studies. In: The Evidence-Based Practice Manual for Nurses (3rd Edition). Editors: Craig JV, Smyth RL, 2012. Elsevier. Titman AC, Lancaster GA. Personal Response Systems for teaching postgraduate statistics to small groups. Journal of Statistics Education, 2011. 19 (2). April 2016. Multi-state Models: An Overview. Leeds and Bradford RSS Local Group, Workshop on Multi-state Models. March 2014. 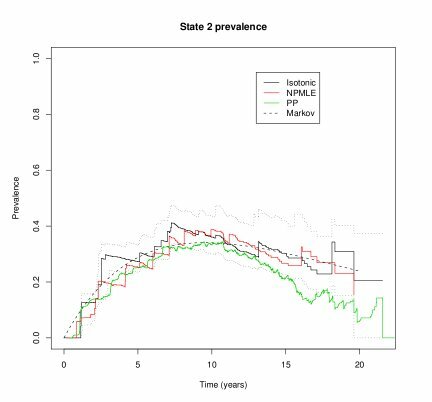 Robust estimates of state occupancy and transition probabilities for non-Markov multi-state models. International Seminar on Multistate Models, University of Vigo, Spain. December 2013. Computationally simple state occupancy probability estimation in multi-state models subject to interval censoring. ERCIM 2013, London. December 2013. Ordinal structural equation modelling of cerebral palsy among European children. Workshop on Using Latent Variables in Health Inequalities Research, University of Manchester. August 2013. Non-parametric estimation of the survivor function for misclassified failure time data. ISCB 34, Munich. October 2012. Assessing goodness-of-fit in hidden Markov models. Analyse de Donn\E9es Longitudinales de Cancer Mod\E8les de Markov Cach\E9s, Toulouse, France. September 2012. Joint modelling of goals and bookings in association football matches. RSS 2012, Telford. March 2012. Semi-Markov models under panel observation. Statistics Seminar, University of Kent, Canterbury. July 2010. Personal Response Systems for teaching postgraduate statistics to small groups. International Conference on Teaching Statistics 8, Ljubljana, Slovenia. August 2009. Accounting for a non-ignornable tracing mechanism in a breast cancer cohort study. ISCB 30, Prague. June 2009. Introduction to Personal Response Systems. CETL Seminar Series, Lancaster University. February 2009. Accounting for informative tracing in a breast cancer cohort study. Lancaster University. November 2008. Multi-state models: Model diagnostics and model extensions. Lancaster University. R code for fitting non-homogeneous Markov models to panel observed data, using methods described in "Flexible Nonhomogeneous Markov models for panel observed data." Biometrics, 2011. R code for fitting semi-parametric models via pseudo-likelihood to competing risks data subject to survival-based tracing, as used in "Accounting for bias due to a non-ignorable tracing mechanism in a retrospective breast cancer cohort study." Statistics in Medicine, 2011.
msm: Multi-state Markov and hidden Markov models in continuous time. R package. 2011. Maintained by Chris Jackson. Contributed to development of functions for model diagnostics. The package also implements the methods in "Semi-Markov models with phase-type sojourn distributions", Biometrics, 2010. Web Page Design by Free CSS Templates.